I came to gardening late in life, thinking incorrectly that all those hanging plants I killed meant that I had a black thumb. As I developed my skills with select perennials, I discovered I really loved watching things grow. 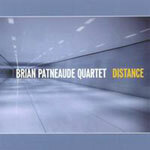 Thats why Distance, the latest disc from the Brian Patneaude Quartet, gives me so much joy. I fell in love very quickly with the BPQs first disc, Variations (WEPA). The compositional skill of Patneaude combined beautifully with the skills of his bandmates, particularly in the dialogue between Patneaudes tenor sax and George Muscatellos guitar. That said, Variations offered a glimpse of the potential of the Patneaude Quartet, and we all know how easily potential can run out of the room. Im breathing much easier now. Distance maintains the original discs spare, less-is-more musical environment while expanding on the groups overall love of exploration. In fact, the watchwords for Distance are environment and exploration. Each of Patneaudes compositions take the listener to a particular place, a particular time, and let you feel what its like to live in that place, or feel that feeling. The inspirational Release takes you to a positive place where you are above all the cares, beyond all the troubles, and any problem gets smaller and smaller as you fly higher and higher. The other end of that spectrum is Alone, where the group takes you to a big, empty house where theres nothing but solitude, frustration, and  ultimately  anger. In between is the title track, which evokes the physical and spiritual space you feel when a loved one is far away, but maintains the connection between you and that other person. The exploration in Distance comes from a group aesthetic that permeates the disc. Patneaude lays a solid foundation at the start of each song, and then the rest of the BPQ develop it like artisans building a house  each artisan with his own wing and his own contribution to the structures overall beauty. As always, Muscatello brings simplicity and substance to every piece he plays on. He takes the first solo on the lions share of the tunes, and you couldnt find a better place to start a journey. As in Variations, he also offers beautiful counterpoint to Patneaudes shining lead lines. To my mind, the mix on Variations gave short shrift to the rhythm section, particularly bassist Ryan Lukas. No such problem here. Lukas contributions get equal time, and his solos are just as good as his foundation work with bop-driven drummer Danny Whelchel. Three cuts on Distance include tasty Fender Rhodes work from Dave Payette. His contributions add color to an already rich musical palate, and although the BPQ matrix can stand on its own, I hope Patneaude finds more room for that color on his canvas. One of the cool things about perennials  aside from the fact that they keep coming back  is the ones that take hold grow bigger and more beautiful with each year. Distance gives me more hope that the Brian Patneaude Quartet will take hold, because our musical garden will be infinitely better for it.